Our online store is now available for USA customers! XiOptics and our customers have a common thread. We both strive to connective optical fiber networks in harsh and demanding environments. XiOptics has one simple goal: Enable the highest quality, most cost efficient optical interconnect solutions for harsh environment applications. We attack this by focusing our resources on the design and manufacture of finest optical termini thhat can be packaged into industry standard connectors. Our products are intermatable with many of our competitors but our feature rich designs and superior materials of construction offer our customers advantages not found anywhere else. XiOptics has used our decades of experience designing, developing and producing a range of Mil-PRF-29504 and ARINC 801 interconnect products for both glass and plastic optical fiber media. Our connectivity solutions work hand-in-hand with multi-sourced, industry standard harsh environment connectors to allow joining of optical media in the connector circular and rectangular formats. We offer solutions for Mil-C-38999 circulars, ARINC 404/600 rectangulars, ARINC 801 circular and rectangular, Mil-C-24308 D-Subminiature as well as the latest micro-miniature circulars. All of our products are assembled at ISO-9000/2000, AS-9100 certified facility. The facility is qualified and personnel trained to the unique requirements of optical component assembly. Our customers operate across the globe, we ship from stock most products, same-day to ensure they can maintain their systems. Our innovative product design uses of only the finest metallic and ceramic materials to deliver the lowest possible insertion loss and stable optical performance in airborne, shipboard, space and industrial/mining applications. Extensive qualification testing by independent laboratories validate our claims. XiOptics provides glass fiber solutions from 125 micron up to 650 microns. Select a terminus format and we can provide a ferrule to accept the media of your choice. 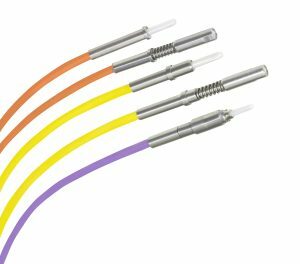 XiOptics is also the market leader in Plastic Optical Fiber interconnection technology. Our proprietary “Unibody” Mil-PRF-29504 and ARINC 801 POF terminus designs ease media termination – even in harsh environments. Our products are flying in aircraft around the world today and have even made their way into space. XiOptics provides POF solutions for plastic fiber ranging from 500 to 1100 microns.